The Hardy family of playing card manufacturers began with Henry Hardy (1784-89) and continued through to Hardy & Sons who finally closed down in c.1840. Above: Standard single-ended English pattern deck with 'Garter' Ace of Spades made by I. Hardy, c.1817. The Ace has "Addl. Duty Sixpence" inscribed three times. The cards show the typical deterioration of the quality of design in English cards at the end of the 18th and early part of the 19th century. The designs tend to take up more space on the cards, losing their profiles, and the figures become more stylised or grotesque. 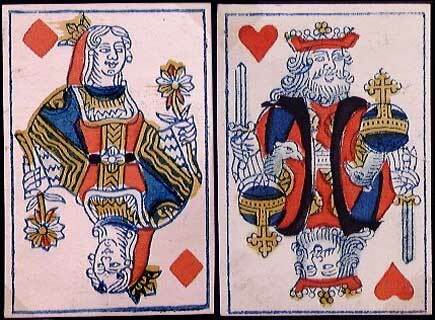 Above: Hardy exportation playing cards with George III Garter duty ace, c.1818. These cards were made for exportation to the colonies, USA, Europe or the Far East, and thus bear no duty. Image courtesy John Sings. 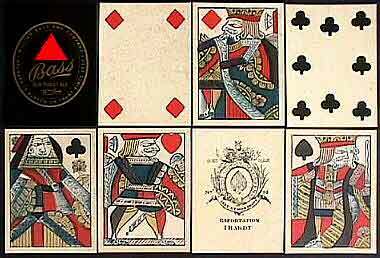 Above: Standard single-ended English pattern deck with 'Exportation' Ace of Spades made by I. Hardy, c.1820. It is not known precisely which country (-ies) these packs were destined for, but quite likely U.S.A. was one destination. Above: interesting double-ended French-style deck with 'Old Frizzle' Ace of Spades manufactured by Hardy & Sons, c.1840. The court cards have the inscription "Dumoutiers a Nantes" so they may have been foreign cards sold in the UK by Hardy & Sons under their own name.